Happy Fat Tuesday (or Mardi Gras, whatever you call it)! We have decided to give up sugar for Lent this year, so we celebrated Fat Tuesday with a multitude of desserts. Today was a field trip with our Latin class to the Pompeii exhibit at the Franklin Institute, and we went to the Reading Terminal Market for lunch afterwards. The Reading Terminal Market is an amazing place- it literally has every type of food available, from sushi to crepes to Philly cheesesteaks. Since we won’t be eating sugar for the next forty days, we had ice cream from Bassett’s (amazing) and a type of Fat Tuesday treat called a fasnacht. It was like a doughnut but a little more…fattening (and delicious). 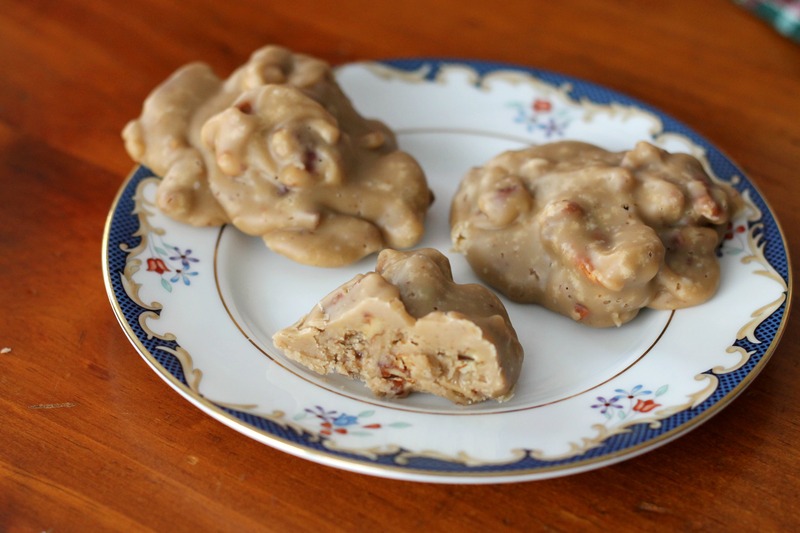 We couldn’t let Mardi Gras pass without eating pralines, though. We made these yesterday, and when I say they are one of the best candies I’ve ever eaten, I’m not kidding. They’re bound to be good, considering they have brown sugar, butter, heavy cream, and toasted pecans in them. They were actually surprisingly easy to make: toast the pecans, boil together the ingredients, let cool, stir until thick, and let set. The only tricky part is getting everything to the right temperature; make sure that you have a thermometer nearby. 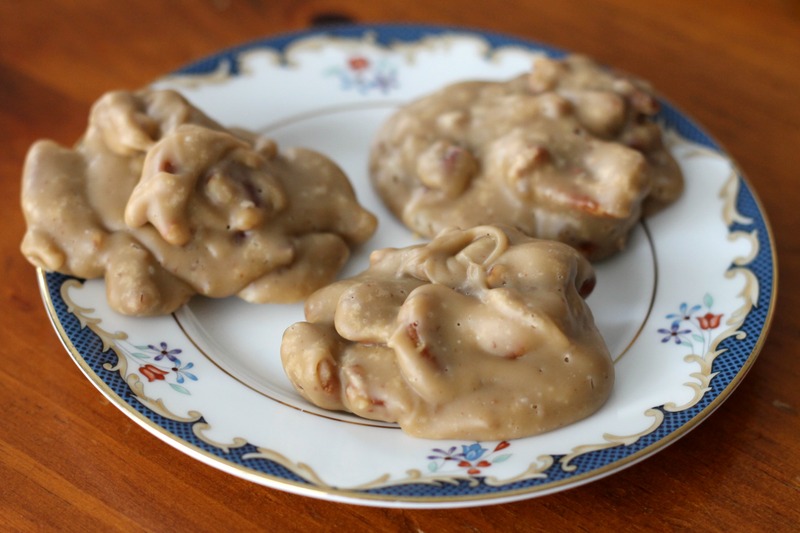 Also, it takes forever for the mixture to cool from 236 degrees to 150 degrees, but be patient because perfectly smooth pralines are worth the little bit of waiting. They may not be the prettiest candies ever, but what they lack in looks they make up for in taste! Spread the pecans in a single layer on a sheet pan lined with parchment paper. Bake in a 350 degree oven for 7 to 10 minutes, or until toasted (be careful not to let them burn). Set aside to cool. Line two baking sheets with parchment paper. Place the brown sugar, cream, butter, and corn syrup in a heavy bottomed pot. Bring to a boil over medium heat, stirring constantly. Boil until a candy thermometer reaches 236 degrees, stirring somewhat frequently. Take the mixture off the heat and let cool until the candy thermometer reaches 150 degrees. This takes about 20 minutes, but it may take you more or less time depending on the temperature of your kitchen. Stir in the vanilla and salt. Add the pecans.Stir constantly for one to two minutes or until it begins to lose its gloss and is thickened. Be careful not to stir it too long or your candy will be a kind of chunky shape. Working quickly, drop the mixture onto parchment lined baking sheets (each candy should be a tablespoon or two). Let sit until they are firm, about 10 to 15 minutes.